According to Hits Daily Double, word from sources in inside The Recording Academy is that AC/DC, Madonna and U2 have been booked to perform at the 57th annual Grammy Awards, set to take place on February 8, 2015 at Staples Center in Los Angeles and broadcast on CBS at 8 p.m. ET. As previously reported, AC/DC is also rumored to headline the 2015 Coachella Valley Music And Arts Festival, along with Jack White and Drake. Coachella is scheduled for April 10-12 and April 17-19, 2015, in Indio, California. AC/DC will be on the road for much of 2015, touring in support of its new album, “Rock Or Bust”, which arrived on December 2. It has been a tough year for AC/DC, starting with guitarist and founder Malcolm Young‘s retirement due to being afflicted with dementia. Then drummer Phil Rudd was arrested in early November on charges of threatening to kill and drug possession. Rudd allegedly threatened to kill a contractor and his daughter, according to New Zealand prosecutors. The allegations were made public December 5. On December 2, Rudd pleaded not guilty to all charges. 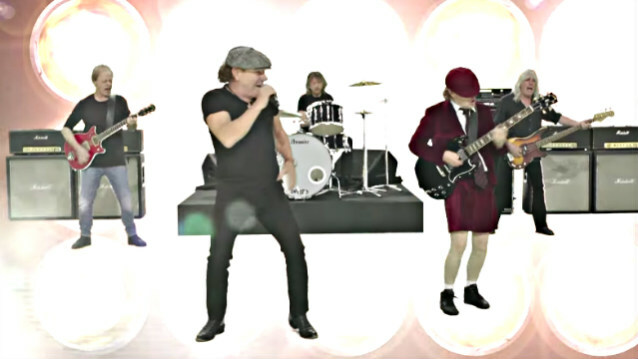 Rudd did not appear in AC/DC‘s two new videos nor any of the band’s latest promotional photos, and his status in the group remains unclear. German/American metallers ACCEPT have parted ways with guitarist Herman Frank and drummer Stefan Schwarzmann. Says ACCEPT in a statement: “ACCEPT would like to thank Herman Frank and Stefan Schwarzmann for being with us these last four-plus years, for making themselves available whenever needed and for rocking their asses off! “We and the fans all knew that they had their own careers and that eventually we would run into scheduling and other conflicts beyond our control. “Herman and Stefan are now ready to take on the world, with their own band PANZER, a Nuclear Blast record deal under their belts and a new album! “We are parting as friends and wish them nothing but success! “We ourselves are getting ready for 2015 — another year of heavy touring! “We would like to say thanks again to our fans around the world for their huge support and for the fantastic year 2014! Herman joined ACCEPT in 1982 shortly before the release of the band’s “Restless And Wild” album and exited the group for the first time after the arrival of 1983’s “Balls To The Wall” LP. 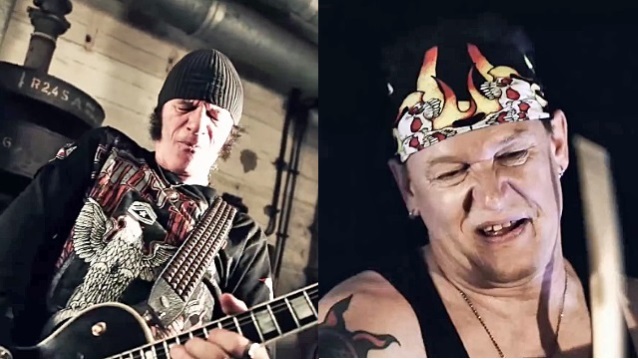 Frank and Schwarzmann were involved in ACCEPT‘s comeback with new singer Mark Tornillo and have appeared on their last three studio albums: 2010’s “Blood of the Nations”, 2012’s “Stalingrad” and 2014’s “Blind Rage”. Frank and Schwarzmann are currently involved in a new project called PANZER, also featuring vocalist and bassist Schmier, best known as frontman of DESTRUCTION. PANZER‘s debut album, “Send Them All To Hell”, was released on November 28 via Nuclear Blast. Swedish bassist Pontus Egberg (THE POODLES, LION’S SHARE, ZAN CLAN) has officially joined KING DIAMOND following the recent departure of Hal Patino. 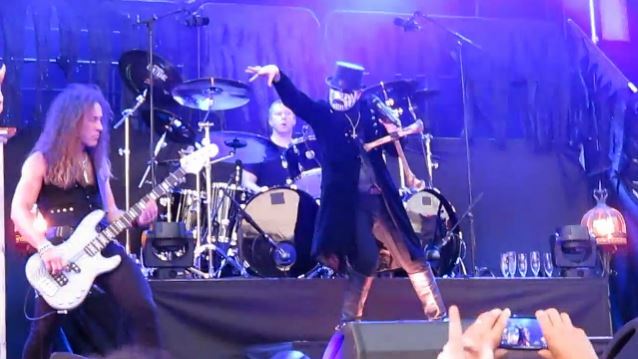 KING DIAMOND played its first show with Egberg on July 25 at Gröna Lund in Stockholm, Sweden. Patino released a statement on July 20 calling KING DIAMOND‘s frontman and namesake “a tired, bitter, old man” and denying that he has a drug problem, despite the singer’s implications to the contrary. After King announced Hal‘s exit from KING DIAMOND, Patino posted a message of his own claiming that he was offered a “totally ridiculous” salary for the band’s five shows this summer, calling the move “disrespectful” and insisting that he quit the band in disgust two days before King announced Patino was “relieved of his duties” as the bassist for KING DIAMOND. King then responded with a lengthy posting on his Facebook page, accusing Patino of “putting out extreme lies” about King‘s character and slamming Hal for asking for more money at the last minute after the rest of the band and the crew already accepted the same salary as they had received for last year’s European tour. “Dreams Of Horror”, a 2xCD collection of KING DIAMOND songs, newly enhanced into ultimate editions by King Diamond and Andy La Rocque themselves, will be released by Metal Blade Records on November 11. “Dreams Of Horror” is the only “best-of” album covering the band’s entire career. King Diamond and Andy La Rocque meticulously mastered and enhanced these 23 songs into the ultimate editions, chosen by the band from both the Roadrunner and Metal Blade catalogs. For 40 years, KISS has been in the business of rock and roll, recruiting legions of fans from all walks of life and every corner of the globe. The time has come to take on your next mission which will surely be the most epic adventure the high seas have ever seen… The Kiss Kruise V! Gene Simmons, Paul Stanley, Tommy Thayer and Eric Singer will be sailing from Miami to Jamaica, October 30 – November 3, 2015 aboard Norwegian Pearl, the central hub for all KISS maniacs worldwide. They’re going back to the golden age when KISS rose to prominence, taking the world by storm. What better way to celebrate the rise of these rock legends than to watch KISS perform the very live album that launched them into greatness 40 years ago? Get ready to rock out to KISS playing their first gold album, “Alive!”, in its entirety. You read it right. KISS is playing “Alive!” from front to back during The Kiss Kruise V indoor show. Year five has promised to bring new surprises and drive you wild and crazy. Book a cabin during the pre-sale and receive a limited-edition The Kiss Kruise V t-shirt mailed to your door before the boat sails. KISS will be inviting some of their favorite bands to join them for this adventure at sea. You can expect artists announcements throughout the year to round out this music festival, so count on your days to be filled with numerous shows, contests and activities. For more information, visit www.thekisskruise.com. Drummer Francesco Jovino has left U.D.O., the German metal band led by former ACCEPT frontman Udo Dirkschneider, for personal reasons. The group is hoping to find a permanent replacement in time for its next world tour, which is scheduled to kick off in early March. 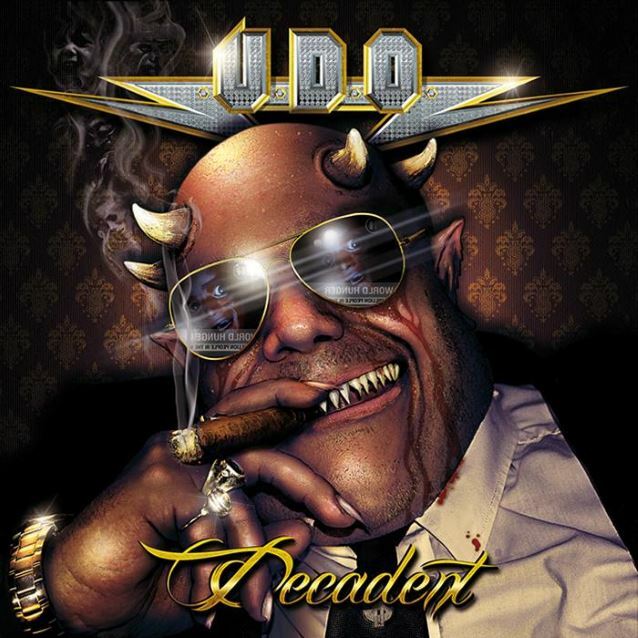 U.D.O.‘s new studio album, “Decadent”, will be released in Europe on January 26 via AFM. With recordings having taken place in Udo‘s current home, Spanish island Ibiza, and also at Redhead Audio Productions in Wilhelmshaven, this new album looks set to be yet another great statement of intent from a rock idol whose place in rock history is already well cemented. “Decadent” will be made available in the following formats: digipak, standard CD, black vinyl, colored vinyl, and as a limited-edition fanbox. U.D.O.‘s most recent studio CD, “Steelhammer”, was released on May 24, 2013 via AFM Records. The effort was produced by Dirkschneider and Fitty Wienhold. U.D.O.‘s latest concert DVD, “Steelhammer – Live From Moscow“, came out in May. The first live release of U.D.O.‘s new lineup (with a Russian bandmember) was filmed on September 28, 2013 at the Arena Hall in Moscow to highlight the “Steelhammer” tour. The band put together an exceptional setlist, including many classics that haven’t been played for a long time, fan favorites and tracks from “Steelhammer”. “Steelhammer – Live From Moscow” was made available as DVD/2-CD, Bluray/2-CD and triple-vinyl in Russian national colors (tricolor). U.D.O. in 2012 announced the addition of guitarist Andrey Smirnov to the group’s ranks. He replaced Stefan Kaufmann, who left the group for health reasons. Jeff adds: “The past five or more years have propelled me a plethora of anger and frustration; I’m actually quite pissed off about a lot of things. SOTO is my outlet to release some of this pent-up emotion. “We realize there are a lot of folks young and old who may be sharing these thoughts, so this is especially for them, too. 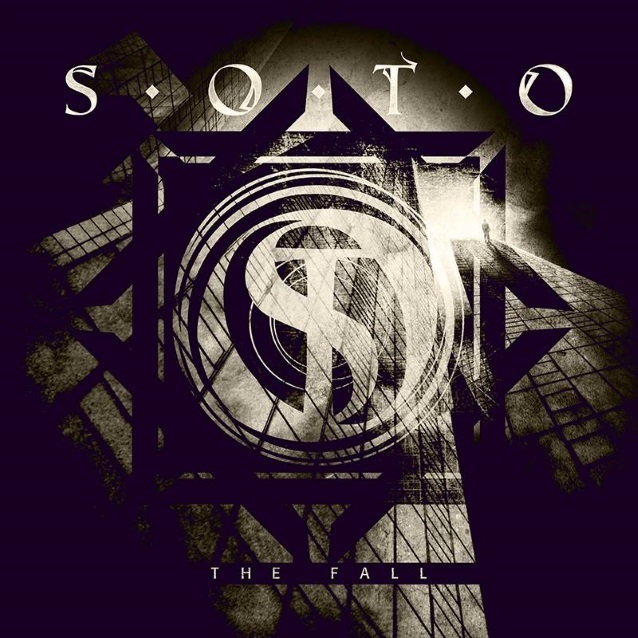 Produced by Jeff Scott Soto, “Inside The Vertigo” features tracks co-written with his bandmates as well as a of his famous friends/colleagues. 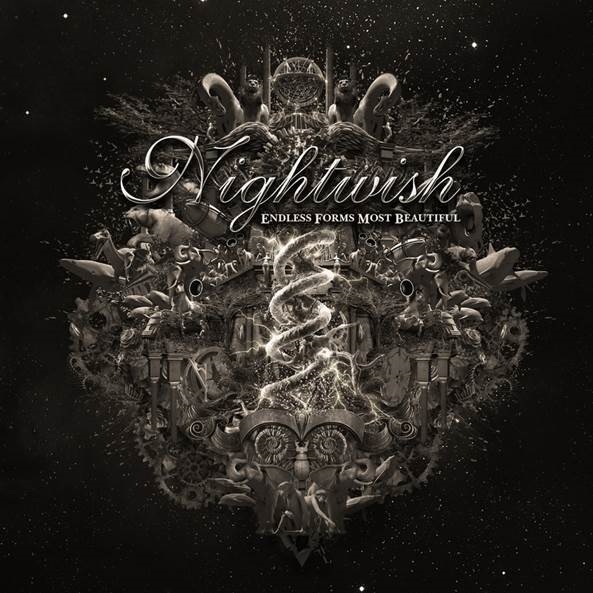 Collaborators include guitarists Gus G. (FIREWIND, OZZY OSBOURNE), Jason Bieler (SAIGON KICK), Mike Orlando (ADRENALINE MOB) and Joel Hoekstra (NIGHT RANGER, TRANS-SIBERIAN ORCHESTRA), all of whom perform on their penned tracks for the album. Others appearing as guests/co-writers are Casey Grillo (KAMELOT), Connor Engstrom, Tony Dickinson, Leo Mancini, Hugo Mariutti and Gary Schutt. “Inside The Vertigo” was recorded during the latter months of 2013 and mixed/mastered in Boston by Soto‘s longtime engineer and friend John Ellis. The release of the album intentionally coincides with the birth date of Soto‘s fallen colleague and dear friend Marcel Jacob of TALISMAN.